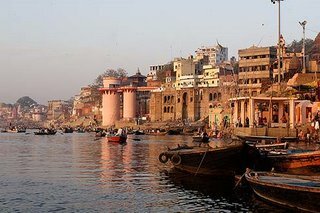 Varanasi or Kashi is older than traditions. Anyone living in India or anyone who calls himself an Indian is bound to have heard about Banaras. Varanasi presents a unique combination of physical, metaphysical and supernatural elements. It is the Ganga Ghats of Varanasi that complement the concept of divinity. Ghats of Ganga are perhaps the holiest spots of Varanasi. The Ganga Ghats at Varanasi are full of pilgrims who flock to the place to take a dip in the holy Ganges, which is believed to absolve one from all sins. Banaras, one of the sacred cities of Hindus stretches along the crescent of River Ganges, its waterfront dominated by long flights of stone ghats, where thousands of pilgrims come for their daily ritual ablutions. Also known as the City of Lights, Banaras is supposed to be founded by Lord Shiva – Varanasi or Banaras is one of the oldest living cities of World. It is also one of the oldest pilgrims of India. Each year it attracts thousands of devotees, students, pilgrimers who come here and stay for long periods. It is supposed one who dies in Varanasi attains Moksha. The majestic Ghats of Varanasi have a unique appeal in them which not only attracts tourists, but also bounds them to come back again. Some of these ghats are very old, as old as pre-historic times, and some of them are very new ghats. There are over 100 ghats in Varanasi. Some of the important Ghats of Varanasi include Assi, Dasaswamedh, Manikarnika, Tulsi and Panch Ganga among others. Tulsi Ghat is named after the famous 16th century poet Tulsi Das, who spent many years on this Ghat composing the Ram Charit Manas. Another historically important Ghat is Panch-Ganga Ghat. Panch -Ganga Ghat as its name indicates, is where five rivers are supposed to meet. Assi Ghat :It is a clay-banked Ghat that stands at the southernmost part of Varanasi where river Assi meets Ganges. Pilgrims consider it particularly holy to bathe here prior to worshipping at a huge lingam, under a peepal tree. Assi ghat is also a favorite site for the blooming painters and photographers. Evenings are very special, as there are musical parties and gatherings on the steps of the ghat. Dashashwamedh Ghat : It is the most visited ghat of Varanasi by religious pilgrims. The name of Dasaswamedh Ghat indicates that Brahma sacrificed 10 horses here.It is one of the busiest ghats. The ghat is close to the famous 'Vishwanath Temple'. The most exciting part is the evening `Fire Puja` performed by the group of priests. Manikarnika Ghat : is the place where dead bodies of Hindus are burnt. It is said that if a person dies in Varanasi, he/she will be free from the cycle of re-birth. It is also believed that fire on the ghat has not stopped for thousands of years. Harishchandra Ghat : The Harishchandra ghat is the said to be the same ghat where the owner of Manikarnika bought King Harishchandra as a slave and made him work on the Manikarnika.The ghat is a funeral place for Hindus, though majority of dead bodies are taken to the Manikarnika Ghat. Tulsi Ghat is another famous ghat, where the famous epic 'Ramacharitmanas' was written by Tulsi das. Other important ghats are Kedar Ghat, Pande Ghat, Shivala Ghat and Chausathi Ghat.